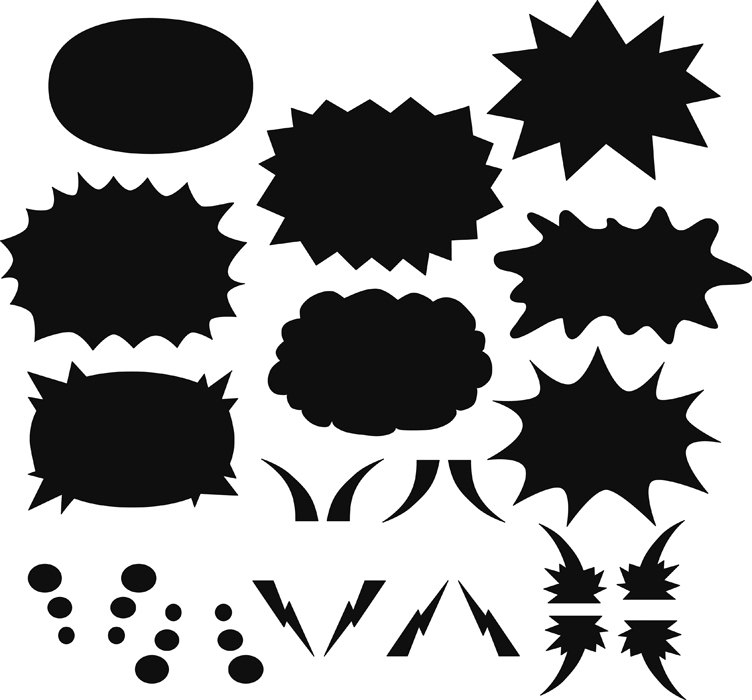 I have all these set up as a custom shapes library in Photoshop. Here’s a step by step on how you can create and add more to the library. – Create a new image, select the pen tool and create the shape you want. – Next go to Edit > Define Custom shape. A dialogue box will come up with a preview of your shape, name it and hit ok.
– Create all your other custom shapes and build up your library. – Don’t forget to save the amended library with your new shape in it. – Now go to Layer > Layer Style > Stroke.. and change the size to 6 (you’ll need to play around with this number depending on the resolution of your image), Position: Center, and Color: Black. Click the New Style button and name it ‘Bubble style’. Now open the image which you want to apply the lettering. 1. Make sure your ‘shape layer’ option is on. 4. Pick white in the colour menu. Drag your cursor, and you’ll have a bubble. 2. Select your tail from the Shape menu. 3. Select the Layers Vector Mask in either the layer window or path window. Drag your tail on, and a separate shape will be drawn onto the Shape Layers Vector Mask. These two shapes can be edited and moved around with either the Direct Selection Tool (the white arrow tool for points) or the Path Selection Tool (the black arrow tool for full shapes) Shortcut is ‘a’. Because the two shapes are part of the same layers vector mask, they will also both take on the Layer Style with the black line. Hope that all made sense. If you find this tutorial useful, leave a little comment and let me know.